Have you been thinking about or actively making efforts to cut down on food waste and save money on your grocery budget? 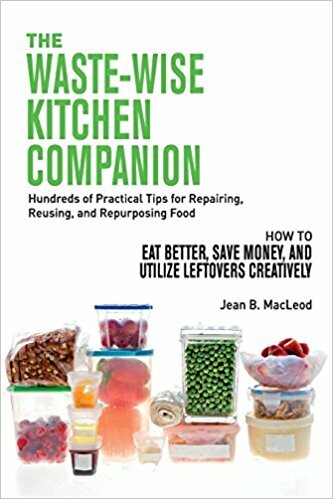 If so, then The Waste-Wise Kitchen Companion: Hundreds of Practical Tips for Repairing, Reusing, and Repurposing FoodHow to Eat Better, Save Money, and Utilize Leftovers Creatively, by Jean B. MacLeod, offers the perfect solution for you. The Waste-Wise Kitchen Companion is a thorough, comprehensive, and well-researched kitchen reference book. After a brief introduction from MacLeod about the values that drove her to write the text, she presents in alphabetical order hundreds of ways to repair, reuse, and repurpose food items that you might otherwise throw away in the trash. Although it is unlikely that anyone would sit down and read this book from cover to cover, it is a useful reference to turn to in moments of need. The book is incredibly well-organized. As noted, it is in alphabetical order, which lends itself perfectly to that reference format. Given its organization, its easy to look at any food item in your kitchen that might need some special treatment to make it more usable and turn to the appropriate section in this book for a variety of recommendations. MacLeod’s information and tips can be applied to anything from day-old bread, the parts of foods that might normally be thrown away, leftovers, and experimental recipes that do not turn out exactly as you had intended. She also instructs on how to feature foods in new ways. MacLeod even offers tips for how to reuse and repurpose items such as vinegar and baking soda that might have been used for cleaning. According to MacLeod, the text is not a cookbook, it is more of a first-aid manual for food. For example, you can revive basic day-old bread with new life through approximately ten different ideas. She also recommends exactly what to do to resuscitate slightly wilted broccoli. MacLeod also weaves in tips and techniques from many different culinary heritages, so that the text will inspire the cook with new ideas. The major drawback for The Waste-Wise Kitchen Companion is that for all its useful information, this book is somewhat lacking in aesthetics. In its present state, visually, it is very well organized, making it easy to find exactly what one is looking for. However, it is all black text against a white background. Colors and images may be unnecessary, but they are nice to have and arguably common for this genre. In this case, for example, images could simply further help to inspire and motivate the reader to try out the recommended techniques. Despite any drawbacks from lack of colors and images, this book is certainly in line with today’s move towards conservation and waste reduction. It is a helpful reference whether you are in a pinch, worried about waste, or just watching your budget. Overall, it’s impressive in scope and usefulness. Truly, it appears as a labor of love from someone who wants to pass on her wisdom to future generations. This book is the perfect addition to every eco-friendly and thrifty kitchen. Given the comprehensive nature of the information and tips included, this book certainly does become a kitchen companion.